We are engaged in offering our clients with a qualitative range of ceilingfanwindingmachines. These machines can work on 500 w inverter and are very smooth in operation. Our range also comprises smooth functionality and has a longer service life. We also offer these in customized specifications as per the requirements of our esteemed clients. Smooth in operation. Preset digital counting meter. Can work on 500 w inverter. Can work on 500 w inverter. We offer our clients with a comprehensive range of WindingMachinesandAccessories that is fabricated in accordance with prevailing quality standards. 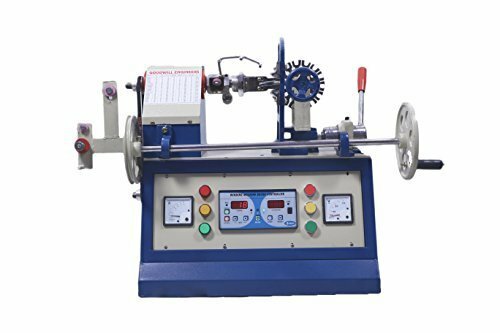 Our range includes Industrial Clutch, Winding Machines, Punching Machines, Transformer Machines, Ceiling Fan Winding Machines, Coil Winding Machines, and Cricket Bat Thread Winding Machines. We also offer our clients with a comprehensive range of Ceiling Fan Winding Machines, Soldering Iron Element Winding Machines, Tear To Tear Rewinding Machines, Hand Operated ADDA (Large and Small), Choke Punching Machines, Secondary ADDA Transformer (Motorized), Min ADDA Transformer Winder (Motorized), Choke Coil Winders, Transformer Coil Winder, Transformer Coil Winders, Heavy Duty Transformer Coil Winders, IFT Coil Winding Machines, Neon Transfer Coil Winding Machines, Coils Samples, and Heavy Duty Bobbin Motorized Winding ADDA. These are offered in varied specifications, sizes and dimensions as per the requirements of our clients. Our personnel do not compromise on the quality and through consistent research programs; bring in innovative ideas to develop these products in unmatched standards. Additionally, we leverage on our high end manufacturing unit, which is equipped with modern machines and equipment to ensure the delivery of flawless range. Thus, with such credible attributes, we have established a strong foothold in this industry and have garnered the trust and confidence of our clients.